Floor level loaded 180º Inverter with special design features to make it ideal for the food and pharmaceutical industries. The FDL can be built with a stainless steel turning body or with a hot zinc spray rust-protected finish. 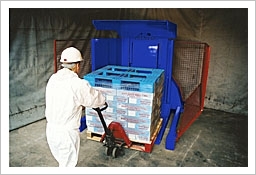 Choice of conventional/ramp loaded or floor flush tables. Choice of 1700 or 2000mm maximum jaw openings. The whole hydraulic system is housed in a containment enclosure with a smooth easy to clean exterior. The FDL is highly versatile but is mainly used to switch raw materials entering food or pharmaceutical plants to hygienic plastic pallets. Standard shipping dimensions: 2.70m wide x 3.00m deep x 2.20m high with guards fitted.